Direct Tax Code is the new proposed bill for changing the tax rules in India. If it comes into effect from April 1, 2011, it will change the whole taxation system and will change the way our taxes are calculated from years . The new tax code will have impact on Insurance Policies, Home Loans, PPF, Ulip, Mutual Funds, Shares and Taxation slab. A common man has to understand whats there in future for him so that he can plan accordingly. However the Direct Code tax is still in draft and might come into effect, but there is no guarantee. Experts feel that it can not come in its original form. Lets see what are the impacts on different investment products if DTC comes into effect . The policy runs till maturity. So if you have anyEndowment Policy or Moneyback Policy and in any year if you paid or will pay more than 5% of Sum assured as premium or make your policy as paid up in between, all the money you receive in the end will be taxed at the time of maturity. For policies where premium paying term is lesser than the total tenure, still all these rules will apply. For example , if you have a policy where sum assured is Rs 5,00,00; then there can be two cases where you will be taxed at the end. First : If you pay more than 25,000 as premiums . Second : Even if you pass this 5% rule , but you do not run your policy till maturity. Deposit more this year (2010-2011, so that amount becomes tax-free at the end . 1.5 lacs interest deduction will be applicable for the home loans where the house is the second one and is given on rent. You might want to reconsider taking home loans if tax break was one of the major deciding factor . In true sense tax break on home loans should always be secondary factor while deciding the purchase of house, because if you look back in your home loan documents, it’s clearly written that tax benefits are always as per the applicable rules of the year. So dont feel cheated and yell on govt for this. DTC does not differentiate between short-term and long-term capital gains, which means that any withdrawal after 31st Mar 2011 will be taxed in the year of withdrawal. Currently any profit earned after 1 yrs of investment is tax-free in Equity mutual funds and Stocks , this will not remain so . So if you have any Equity mutual funds or stocks with you, better sell them just before 31st Mar 2011 , so that current tax rules apply to that part of your investments . Sec 80C will be replaced by Sec 66 and limit will be raised from 1.2 Lac (20k for Infa bonds) to 3 lacs . Have a look at following classification of profucts from taxation point . Hello, For a ULIP plan of LIC started in 2010, I am paying annual premium Rs 50,000. Term is 35 years. Sum assured is Rs 5 lacs Life cover and Rs 5 lacs accident cover. a) Will the premiums paid in subsequent years be Tax exempt? b) Will proceeds on maturity be tax free? i want to take 10 lakh LIC Money back policy. the premium is 64 K so can i claim taxbenefit on entire 64K after Direct tax code. You will get tax benefit only if your premium is below 5% of total SA . Which is not their in your case ! 1. In the post you mentioned – ‘So if you have any Equity mutual funds or stocks with you, better sell them just before 31st Mar 2011 ‘. Do you mean we should not invest in MFs such as HDFC Top 200 etc? 2. My spouse is house-wife. If she happens to gain profit by selling shares (not intra-day), I understand she will need to pay capital gain tax. So how will she pay that tax. I am employed and my employer computes and deducts tax and at the end I file Form 16. Not sure how my wife will pay, does the Online trading firm directly deducts this profit tax? How will my wife come to know how much profit she made in the year and what is that she need to pay? 1. I said that because of DTC , as there will be tax on long term gains after DTC comes , so you can sell the share or MF just before Apr 1 , 2011 and book the profits (if after 1 yr) and reinvest . 2 She will have to pay the tax and file the return her self . She will have to pay tax at the rate of 15% on all the profits she makes in a year . Also she will have to keep track of the profits she is makes, its her responsibility . My questions may have sounded foolish but thanks for spending time and clarifying it patiently. The questions you asked were not foolish , they were genuine and very common . Does that mean that if I start a SIP in ELSS scheme this year for 10 years then I will continue to get EEE benefit when I sell these units? Me glance through with article pertiment to EEE in today’s economics times but didnt understand …could you pls educate the same . I didnt get your said “You are also inclined more than required on Debt side as well ” kindly precise …. And yeah you truly advised about Life insurance …that’s prime reason I have planned for ULIP which will deliver benifit such as insurance + investment +tax as it’s equity linked ….would you advise me to opt this or shall I consider any good goverment approved LIC scheme which will fetch steady return . This is with addition to above mentioned . Can you pls advise any best term plan which could cover me and my partents ….confirm EMI cost too if psbl . If I start a SIP in ELSS scheme this year for 10 years then I will continue to get EEE benefit when I sell these units? Would appreciate your assistance over my below inverstement planning as am very new in this financial jungle . First -From next nonth onwards I have planned to invest per month 13k in Mutual fund via SIP which comprise 3 open ended euity diversified fund and 2 ELSS to save tax under 80 C.Here , I am having long term investment horizon say 20 yrs . My past investment includes only one LIC of 11 k of premium . My current age is 26 .Objective of investment to build good corpus over long period of time . After going through all above debate its really difficult for me to chosse right path specially Mutual fund which will be leveid for tax on this capital gain after this DTC code into effect . Your suggestion will be indeed great help for me . You are young , Your view on mutual funds look good , however your approach towards Life insurance does not look best . You are also inclined more than required on Debt side as well . Take a term plan , start sip in Index and Equity funds , Have your company EPF . thats all . If today i invest in ULIP before DTC is implemented, then will i get tax benefit on maturity under Section 10 10 (D) (if premium is more then 5% then SA)? DTC will be implemented on ULIP investments after 1-4-2011? Or it will be implemented on old policies also? I have been informed by ULIP company that DTC will be applied only to those who invest after 1-4-2011 and they can assure me this by writing on stamp paper. 1)How Do you Think Mutual Fund is anyways better than any Endowment Plan (premium less than 5% SA) after DTC? 2)Why are you still suggesting people for Mutual Funds and NPS? 3) What is this NPS and How is this better than EPF or PPF? For other doubts see more articles from archives . just came across this blog, very interesting discussion. the worst thing about DTC is even principal is taxed on PPF withdrawals & i think its unfair and unethical. This tax code is a big joke for salaried upper middle class. All the investment instruments are being made taxable. How are people suppose to save for their retirement. India is trying to copy western countries to simplify the tax code, but with half baked provisions. In western countries citizens get first class infrastructure on paying taxes. What will a citizen receive here, let me guess – highly corrupted government setup and a below par continuously degrading infrastructure. From that angle , yes there is not much we get from paying tax . Also the code is being rewritten again now , so i am sure the changes will not come in its original form. Even though the code is being re-written, the basic theme will not change: EET. That means, we will not tax you until you accumulate wealth for us (Govt. ), then, when you withdraw, we will tax you taking away your (or Govt.’s) accumulated wealth – which you (investor) invested for us (Govt.) sensibly. Increase in tax slabs is applicable until we are getting salaries. Later, during retirement, we will not be able to get all our money if we want at one go – it will be taxed, whether low or high tax slabs. The old days of saving in Gold and then dumping money in your backyard are going to return soon! One doubt should be clear to all of us (Janta), since EET will be good for any Govt., this will not be opposed – if not next year (2011), it will be implemented anyway eventually with benefit to all… All the parties will know that more money is coming in via EET! Great read in much simplified form and was able to understood most of it. It is sad to know that if the tax brackets are widening; on the other hand Government would embark upon the long term gains of individuals which will offset the benefits that people may get under DTC. If I were to interpret, this is simplification of the process; which doesn’t necessarily promise any concrete betterments for the tax payer, my personal opinion. If everything becomes taxable whats free now? Of course bill has not come in to effect yet but it has faint chances of being implemented in its current form. This was just proposal. No one from finance ministry has confirmed yet officially that this is going to be implemented as it is. Also this wasthrown open to public so that they can register their responses to the code. Infact there are unconfirmed news that this code will be re-written again. Anyways with current proposal for sure housing sectore and MF companies are already lobbying hard for apposition of this code. Wasn’t there a point dealing with long term capital loss ? Can we get benefit from it … as in equity we may face loss in a period of time . although this question is not related to this topic. I would like to ask you to review new Smart Loans offered by HSBC and also any such such products from its competitors. Here’s my take: in it’s current form, it appears that the entire amount accumulated on maturity will be clubbed with the income for that year and taxed. EET only means, as someone pointed out, a transfer of enormous liability. If the new DTC code comes with the same outlined provisions as per draft code on long term wealth creation, never mind the expanded tax slabs and inflation effects, the net amount in the hands of investors will not be much to cheer about. All this would mean is reduced consumption at every level. Any smart investor would automatically reduce consumption (sorry Sony, I LOVE your LED TV, but I don’t have the money), knowing the big train wreck called Tax would take away a substantial chunk, to make up for the shortfall. Given that the Indian economy is driven primarily by domestic consumption, this could have a devastating effect on business and consequently, the stock markets. Thanks for putting your views . Looks like they are rewriting the tax code now . Lets see how it frames up . But just a doubt, is there any benefit for a salaried person other than increased tax slabs and simplicity in taxation (which is again not a monitory benefit)? Whereas it seems to be putting on more burden on common man’s money. Can you please throw a light on this aspect? Also, would you recommend someone to delay his mojor investments for another one year (e.g. for retirment etc.) if he is just prepared to put a big chunk for that? your tax exemption limit also increases from 1 to 3 lacs . I would say one can wait for 1 yr to get more clarity on this . 2. I should get facilities for the tax I pay.. I need better roads.. better living conditions, better health care, better education system…. better control agencies….. (eg.. who cares and fines a Car manufactures/ Bans a model.. when all his cars are burning on road)…..
6. I need a leader who can lead us/powerful leader who can implement it!!!! a very thought provoking article indeed. this shall help us plan our future finances in advance. but as everybody is speculating the dtc shall not become applicable in the form it was presented initially. some experts even think that the DTC may not be effective at all. 2. the profit on the MF at redemption even if more than 1 year old will also be taxed (any way what shall be the rate of income tax over such profits; any special rate or shall it be just added to the total income). in this case the profit of mutual funds , post inflation and post tax will be quite less. Today one agent told me that insurance is a contract, so maturity amount will be tax free under section 10 10 D. Do you have any idea about this?? Will tax at maturity where the premium is less than 5% of sum assured be applicable to even existing insurance policies??? Your agent does not understand “Contract” it seems . Its true that Insurance Policy is a contract ,however its clearly written in the Contract that “tax rules are subject to change and will be applicable as per the applicable year” . Yes , DTC rules will apply to existing policies . Thanks alot Manish for clearing my doubt. Good article explaining DTC. It is much awaited towards simplification of Income Tax. It’s always a kind of headache to file I-T or keep track of things. I heard from so many friends who tends to avoid filing just because they dont understand bit of it. All finance minister promises for simplification but ultimately add more twist in it. I’ll be so glad if Govt. can bring it in present or more good form but due to past record of govt in such matters, I suspect they will screw it up and bring a product which may be better than present one but not so promising as it looks like now. Yeah .. But things will get more easy once it comes , It may look compliacted in start , but will be easy . Yah manish, What I was saying is that DTC looks very promising and easy right now but govt. might make it complicated before actual implementation. First of all Great Job Man !!! Just saw that Jagoinvestor is among the most read Blog on Personal Finance (Published on LiveMint). Just a query, as you mention under proposed Sec 66 ELSS would also qualify. But I read somewhere that there would not be any tax benefit for ELSS schemes under DTC. What do think on this? I think I have not mentioned anywhere that ELSS will also be part of sec 66 . Where on the article do you see that ? I think taxing the matuirty amount on Mutual Fund is a killer.Even if MF gives return of 30% you will taxed 20% of that so effectively you get 10% only . (assuming you were in 10% slab after clubbing you will be in 20% slab).I feel PPF is better option than MF you will save tax upfront atleast. What is your view? not sure , this needs some analysis . Anyone ? This is a wrong calculation. Only the profits from a MF is taxable.So if you get a return of 30% in a year on an investment of say 1000rs. At year end you have 1300. If you fall in 20% tax slab, you pay a tax of 20% of 300=60.So you have with you 1240. Thats 24% return not 10%. Good to see an article on Direct Tax Code. I am not happy with the maturity sum being taxed in all instruments and that too at one go. That sounds a bit cruel..
For example if my yearly income is 7,00,000 ill fall into 10% tax bracket. But with a maturity of some investment which would be arnd 5-7 lakhs.. ill have to pay tax at 20% above 10 lakhs where as I had made investments over the years and I have got the maturity amount based on the discipline investment over the years ! Not sure , you only pay taxes on the incremental interest . So if you invest 50 lacs and get return of 1 lac in 5 yrs . You cannot be taxed at 51 lacs , it does not make sense . My opinion is that when the DTc comes in to effect…. Indexation should be there while considering tax…. similar to the indexed/ Non-indexed taxation for debt mutual funds.. or something similar…. otherwise it is not fair…. I think this was in proposal as well. With DTC, EET is being implemented.Means for instrumrnts for which one claims exemptions now,you need to pay tax even on the priciple. With EET you just postpone the tax payment. So if you invested 50 L as principle and earned some 30 L in interest by investments in a PPF account.you pay tax on 80L only. hmm.. thats bad actually , so if I have 50 lacs today , then if I just keep it as it is at home , after 5 yrs, its 50 lacs only and No tax on that . but what If I invest it somewhere and it increases by 10% per year and becomes 80 lacs , now I pay tax of 30% on this , which is 24 lacs ,which means i get 56 lacs as total at the end . Does not make sense at all . Are you sure on that you said ? Yes. It is correct. On DTC implementation, you can postpone the tax payment but cannot avoid it. This again depends on the tax slab at the year of withdrawal. In the example you gave if the slab is increased during year of withdrawal, you pay less tax. i would like to differ from ur calculation a bit. it all depends whether the 50 lacs is already tax paid or not. in another case when u invest 50 lacs in a scheme for avoiding income tax over it and the resultant amount is 80 lacs then the whole 80 lacs would attract tax @ 30 % = 24 lacs and u shall have 56 lacs left. the third case is the exact EET method. There is no corrections required in what i had mentioned. If you read carefully I had said in the very first line ‘For instrumrnts for which one claims exemptions now,you need to pay tax even on the priciple.’ Making it clear ,ONLY if exemptions can be claimed in an investment (like in case of PPF) the principle gets taxed in DTC. Thus its called EET regime. If for an investment exemption cannot be claimed,principal doesnt gets taxed. Its quite obvious if you do a regular FD,you need not pay tax on the principle,you pay tax only on the interest. Also ,for any example ,if you say one invests a sum,it would be safe to assume that the whole money is available for investment.If tax is not paid on any income,it cannot be counted as available for investment.Hence you assuming when i say 50L is invested,that 30% tax is deducted and only 35 L available for investment doesnt makes much of a sense. by saying “dear manish ” i meant manish chauhan and not manish s. that means i was responding to manish chauhan’s calculation and not to manish s. (i had pressed the “reply ” tab under mainsh chauhan and not under the post of manish s) . any way i agree with u manish s.
only one small doubt. u say “If tax is not paid on any income,it cannot be counted as available for investment”. why do u say that. till now whatever amount is invested in PPF is not tax paid and is still available for investment. please elaborate on the above sentence so that every one can get knowledgeable. If he hasnt paid tax on the Income and plans to pay tax,then we cannot say he invested 50L .In such cases 50L will be income and 35 L will be his investment. Ijust wanted to emphasize the difference between Income and Amount invested. Anyway,i think we mean almost the same. Thanks for enlightening everyone on the black box called DTC. I have a query on PPF post DTC. Though everyone as been feeling assured that a least the amount they have accumulated till 31st march 2011 will be exempt from tax at the time of withdrawl, there is no mention anywere either by Govt or in any forums regading applicability of tax on interest which will be generated after 31.03.2011 on the corpous which has accumulaed till 31.03.2011. Will it aso be exempt like the principal daed 31.03.2011 or it will be treated like contributions/inetrest after 31.03.2011 for tax purpose. Interest accumulated till 31th Mar 2011 will be exempt from tax . After that it will be taxed . In the present DTC draft, PPF is still considered for tax exemption. 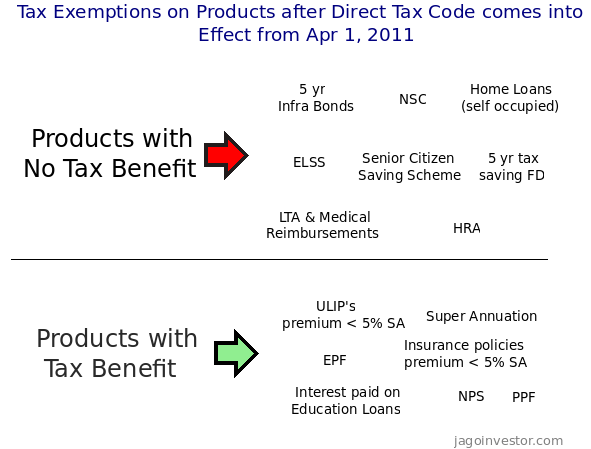 In the picture, you have mentioned PPF under “Products with no tax benefit”, I think it is wrong. Cross check and correct it. Due to the opposition from the various parties, the current draft code is completely dropped and now govt is re-writing the DTC code and will be completed by June end. This draft will not be available for public debate. I think we have wait for few more months to review the near to complete version of the DTC. Yeah . I put PPF by mistake it seems . I made the changes . Also about rewriting of new tax code , its a great move , however personal finance part is just one of them , Lets see how much changes they make . What would be the impliations of DTC for NRI’s with sources of income in India & from sources of income from abroad? What investement strategies one should adopt in the aftermath of DTC coming into force ? I know you have mentioned a few points in your blog but it would be of great help for investors like us to know a bit indepth. Thanks & keep up withe the good work. The same thing would imply for NRI’s as well . However defining strategy at this point is not possible, I will try to write about it in Future . The articles mentions NPS under “products with tax benefit”. What are the tax benefits being referred to here? it means tax exemption while contributing money . Stock market crash will depend on how many retail investors are there. But there could be lots of churning. Also you got to pay tax on the amount taken out from stock or Equity mutual fund if it is less than a year. Housing is always a conspiracy of government/builder nexus. What is the point in giving benefit on the non self-occupied home. What is the vision here? Only government knows about it. So buy house and give it on rent. Or do some exchange deal with your friend. This might help. I think house swapping will be a good idea . however not sure how many people will do it . It will be sad if the tax benefits on the long-term capital gains for mutual funds and equity holding is relaxed….people might start pulling out the money from stock markets — what do you think? If this turns out to be correct analysis, I can foresee a stock market crash sometime in Feb-March 2011. I would say a big liquidity crunch from mutual funds , so that would result in a sell off . However I dont think it will qualify as a CRASH . Dont you think the DTC thing is not going to change mentality in big way . > Dont you think the DTC thing is not going to change mentality in big way . I dont think so , long term capital gains tax came into effect some years ago itself , it was not there before , stock markets trading and investments was always there , We should not feel too bad about it . We are getting so broad tax slab from DTC , thats the best thing . These are my peronal views . What are your views ? Economically, in the long term, this seems to be a good thing. The timing might be bit early — we as a country are just coming of age in terms of the masses considering Stock Markets as a viable investment option. One of the big drivers, psychologically, is the fact that one can have no tax liability for long term gains. Esp for a lot of retail investors, who did move from traditional investment products like FDs and Real estate. This might not crash the market — but might impact the financial planning of an average retail investor like myself. didn’t you mean 2011 in your second line..
Err .. yup 🙂 . I changed that . Would like to hear your views on this whole DTC thing ? 1. Can we do partial withdrawals from a PPF account? Say 15 year term is completed and you have accumulated 10 lakhs, can I withdraw 2L and rollover the rest to a later point (i.e. 5 year term)? 2. Will the new ULIP/Insurance policy changes (5% rule) impact existing policies? 1) Yes , you can withdraw partially from PPF , you dont have to wait for 15 yr ,you can start partial withdrawal after 6-7 yrs itself. 2) Yes , it will apply . So if you any existing policy where the premium was not less than 5% of SA , you will be taxed at maturity . I bought it 5 yrs back, now its too late to leave it. I got rs 24000 as bonus also. No I dont have any existing investments in ULIP. I was just wondering if it made sense to enter now. but with your clarification it would be wise not buy any ULIP just from tax angle. PPF I have been investing for the last 4-5 years. 1. What is the maximum amount that can be invested in NPS? 2. Do you have any updated view on NPS? 3. Would term insurnace also be counted as item under tax benefit section? 2) Looks better now, can be considered . How do we pay NPS premiums, Can we pay online, or do we need to go to NPS specified banks. Any idea?